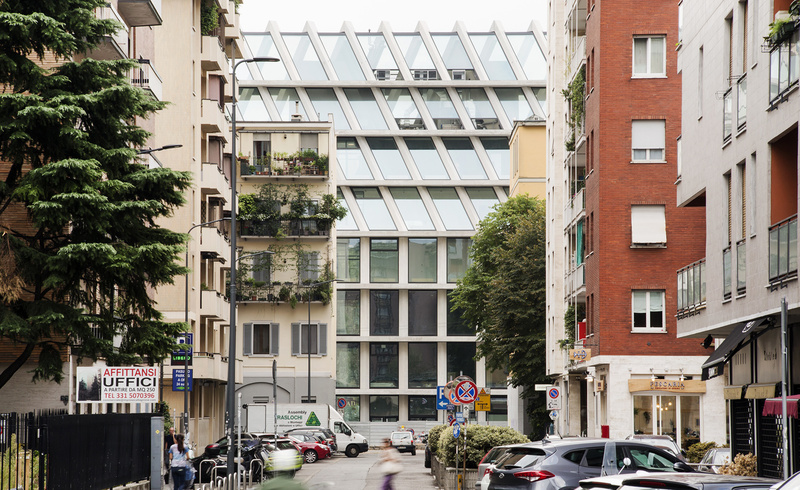 Herzog & de Meuron have unwrapped the packaging on the new Feltrinelli Porta Volta building in Milan, the firm’s very first public structure in Italy. Around the corner from Corso Como and a short walk from the city’s Porta Nuova district, the new twin-building structure has been erected on the site of a former garden nursery, which was previously encircled by a less than desirable mix of cracked sidewalks, post-World War II rubble and run-down car washes. The secret weapon aiding this endeavor is COIMA, a real estate investment company whose main mission is urban landscape refurbishment. COIMA specialises in transforming city wastelands into flourishing bastions of gleaming skyscrapers and lush public lawns, as has been demonstrated in its mighty overhaul of Milan’s Porta Nuova district. The project saw 22 new skyscrapers – all LEED Gold-certified buildings – erected over a brisk (for Italy, at least) five year period. The Feltrinelli Porta Volta building has a similar ethos in that a crumbling, misused slice of the city has now found a new lease of life, while also reflecting and respecting its neighborhood environs. Inspired by the cascina buildings of traditional rural architecture in Lombardy, the building is only five stories high, but its first two floors boast 7m-high ceilings that allow for fantastic light and its modest size fits in with its palazzo-lined street. One of its buildings will house the headquarters of the Feltrinelli Foundation, while the second will serve as Microsoft’s new Italian hub.